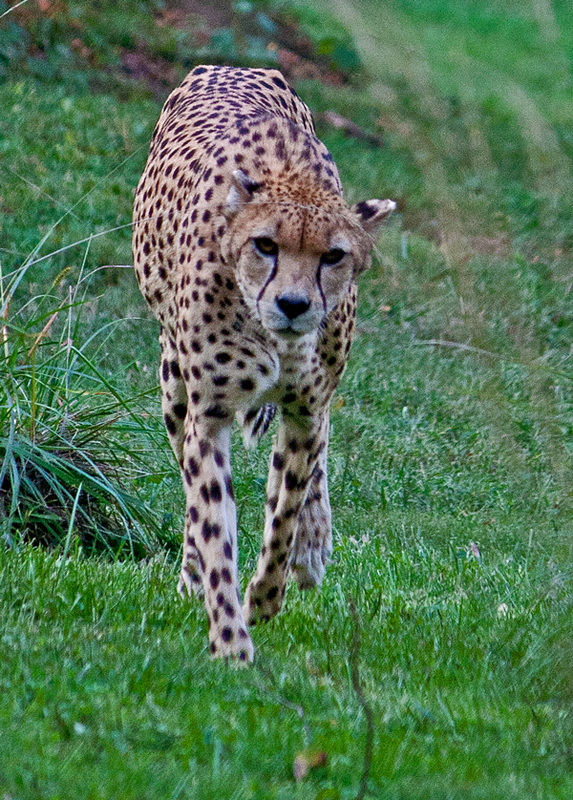 Photographed yesterday at the National Zoo in Washington, D.C. where I spent hours observing the cheetahs. 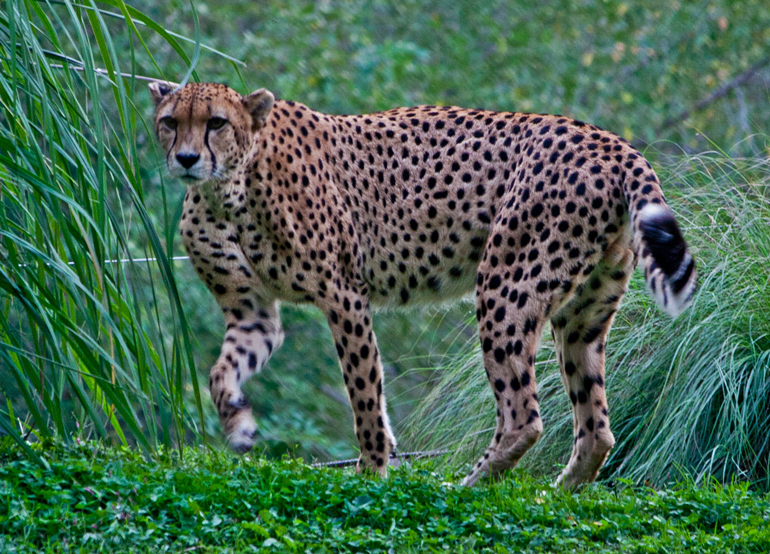 There is so much to love about cheetahs—their elegance, speed, coloration, and strength. This image shows that they also have beautiful eyes. Walking along Rock Creek in Washington, D.C. on my way to the National Zoo yesterday, I came upon some ducks in a area of the creek where the water was still. I knew that they were ducks, but when I zoomed in on them I was surprised. One of them was the most unusually colored duck that I have ever seen, with a strangely shaped head, brightly colored feathers, and red eyes. 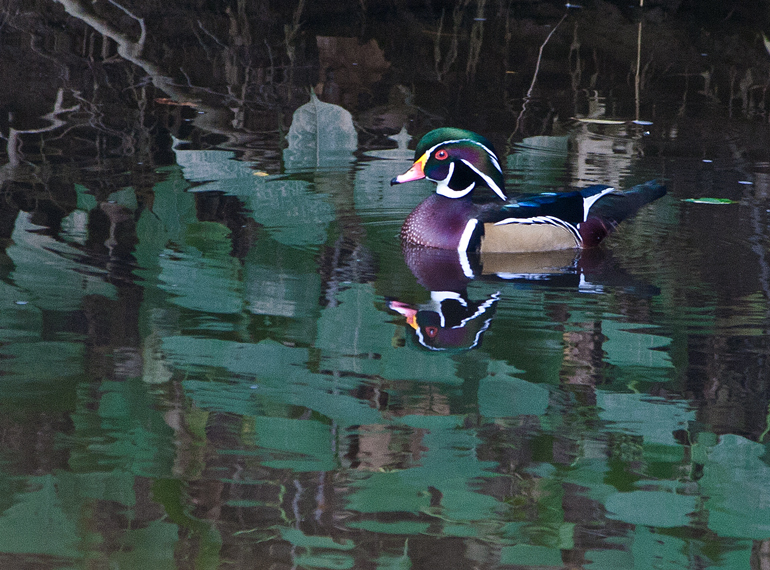 I did some research and discovered that this is a male wood duck. If you had asked me yesterday about wood ducks, I would have thought you were talking about those hand-painted decoys. 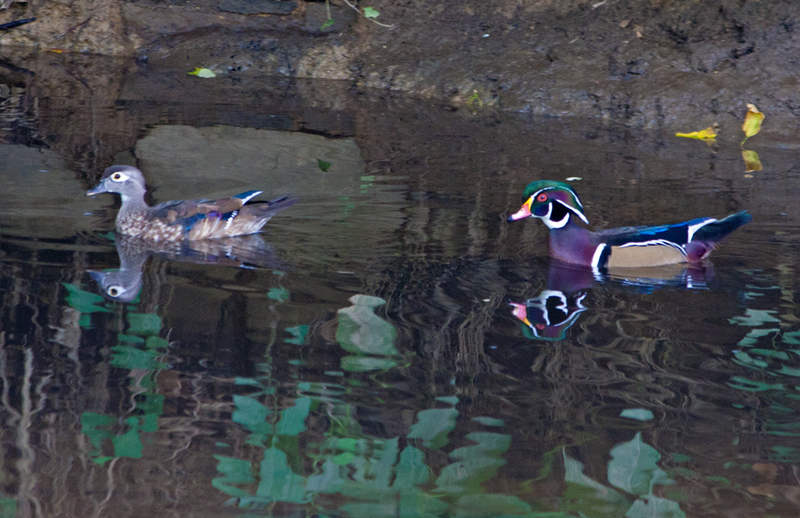 I managed to get a shot of the male wood duck swimming along with a female wood duck. The photo is not quite as clear as the first one, but it shows the difference in coloration between the male and the female. The female is more delicately beautiful than the male, who is really ostentatious in appearance. I seem to have a knack in discovering brightly colored creatures, whether they be grasshoppers or duck. I hope my good fortune continues. I visited the National Zoo in Washington, D.C. this afternoon and spent the lion’s share of the time with the cheetahs. 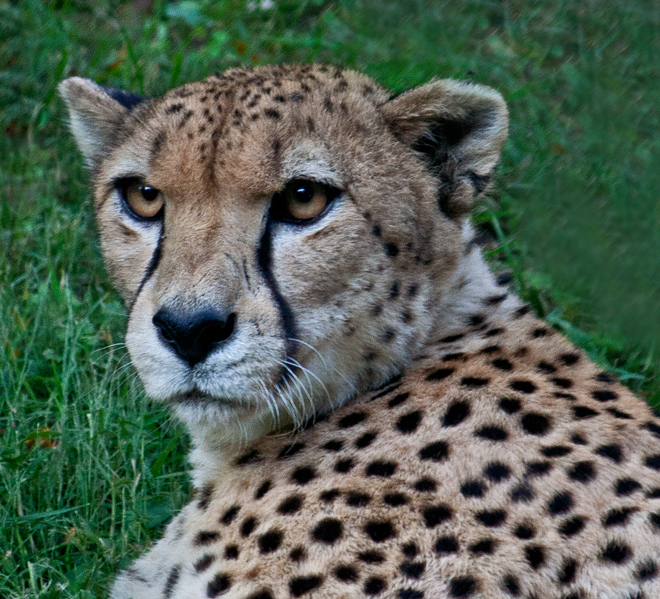 National Zoo has a very active cheetah conservation program that you can lean more about on its website. At the moment there are six cheetahs (three brothers, one female, and two cubs) that live at the zoo, according to the website. Most of my time was spent with what I believe was the three brothers (named Draco, Granger, and Zabini), who were together in a single outdoor enclosure. If they were brothers, one of them seemed to be considerably larger than the other two. The zoo website indicates that the brothers were born in 2005. I haven’t had a chance to go through all my photos, but thought I’d post a couple as a kind of sneak preview. I know that some folks object to photographing animals in captivity and apologize if I have offended anyone. However, especially in the case of the cheetahs, I encourage you to check out the work that is being done to preserve this magnificent species as well as others. Wandering yesterday through the marshy area of Huntley Meadows Park, I spotted a large bug perched near the top of one of the cattails. I could not really see for sure what it was and it flew away as soon as I took one photo. When I opened the image on my computer, I saw that I had captured an image of a strange-looking bug that seemed to have the blade of a circular saw embedded in its back. It did not take much of a search on the internet for me to discover that it is a wheel bug (Arilus cristatus). 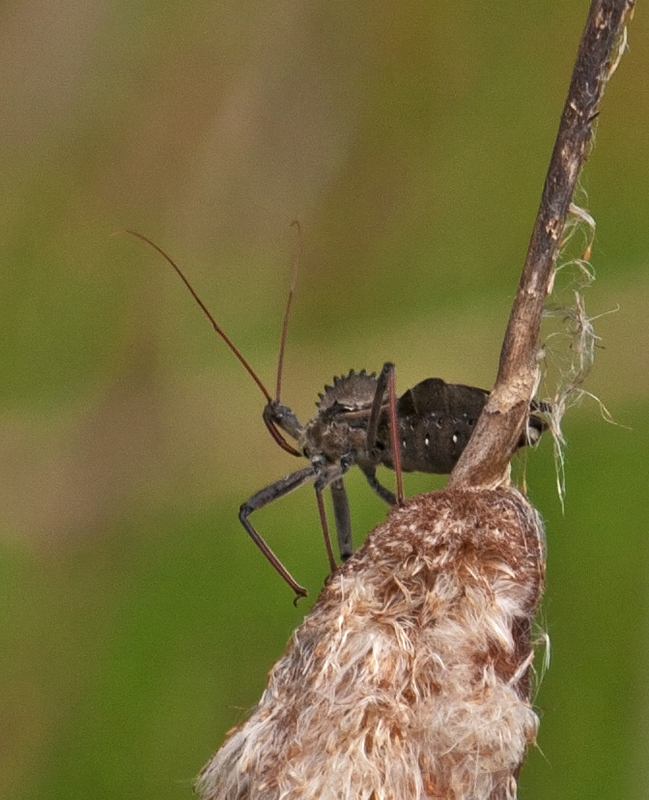 The University of Florida Entomology Department website notes that the wheel bug is an assassin bug that administers a very painful bite, described as worse than the bite of a bee, wasp, or hornet. Wheel bug saliva contains a toxic, paralytic substance that immobilizes and kills its victims (caterpillars, bees, aphids, and other insects) usually within 15 to 30 seconds after injection. Personally, I think this insect looks like a miniature dinosaur or something out of a low-budget science fiction movie. In any case, it is certainly one of the strangest looking creatures that I have ever encountered. As we move deeper into autumn, I expect to find the colors orange and yellow only in the fall foliage or an occasional sunset. Yesterday, I was surprised to see this orange-and-yellow butterfly flitting from flower to flower, seemingly oblivious to the changing seasons. Doesn’t he know it’s almost October? 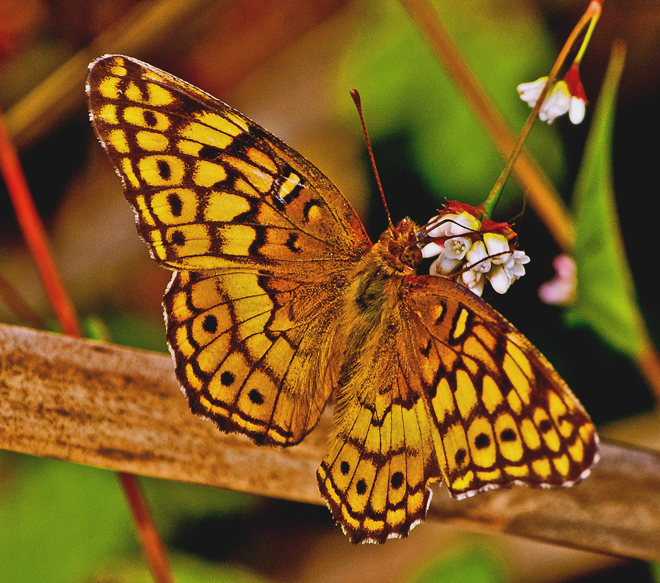 Is it eternally spring for a butterfly? 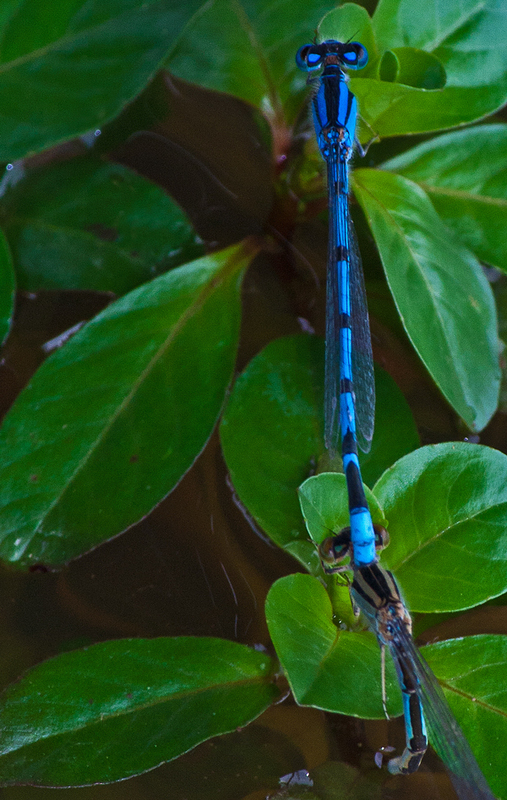 Damseflies are really small and if they were not brightly colored, they would be difficult to see. However, when there are two of them flying together (really together), they are slightly easier to detect. 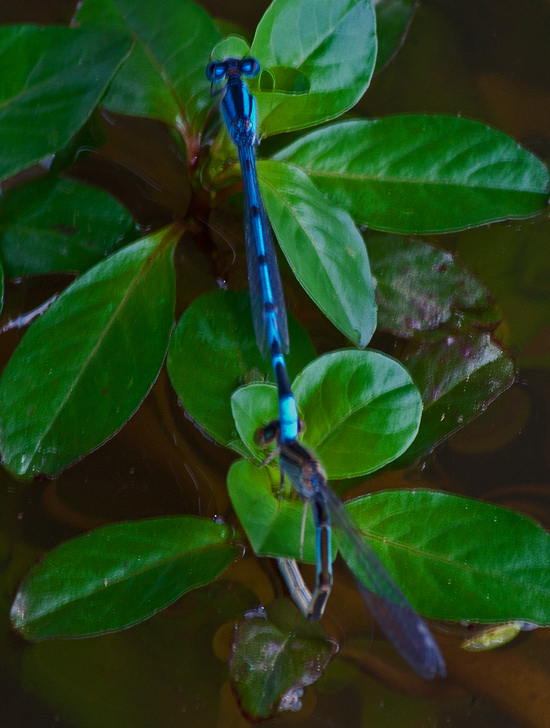 Anatomically speaking, I am having a little trouble figuring how the mating takes place with the damselflies as pictured below, but suffice it to say that damselflies are more flexible and acrobatic than I had previously thought. I took these shots this afternoon at Huntley Meadows Park in Alexandria, VA. Getting a decent image was a bit of a challenge because I was shooting from a raised boardwalk almost two feet above the water level and the damselflies keep landing on vegetation that was just in the shadows underneath the boardwalk. 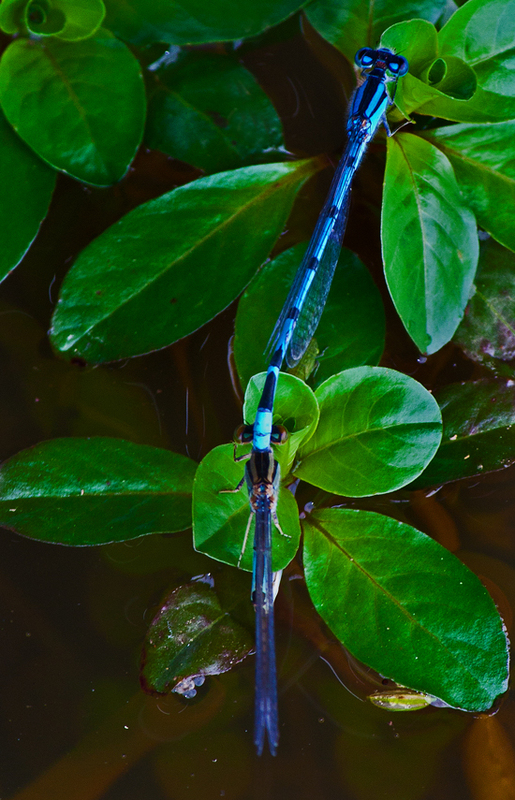 As a result, my position sometimes resembled that of the lighter-colored damselfly. 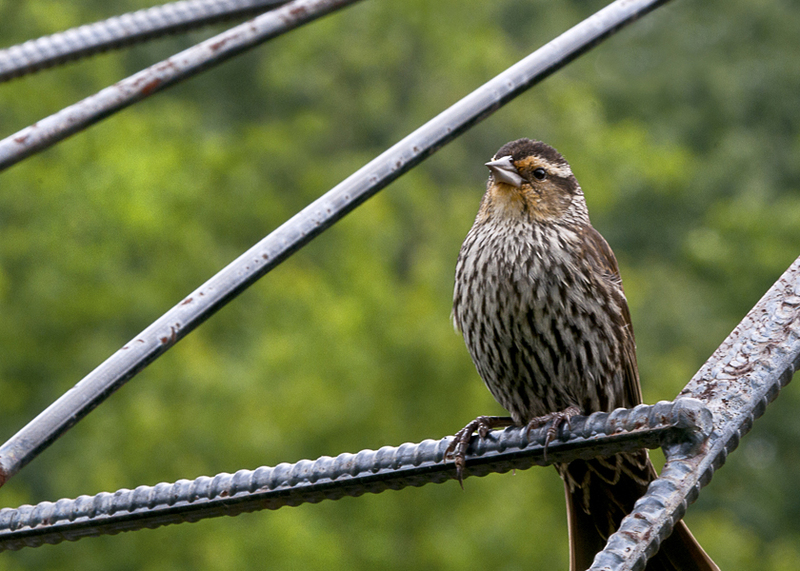 I have recently been making a lot of attempts to photograph birds, but none of the photos comes close to matching the visual impact of this female red-winged blackbird that I photographed in early June at Brookside Gardens in Wheaton, MD. Normally you are not supposed to photograph a bird from the front, but in this case it seems to heighten the intensity of the bird’s stare. The sky was almost white that day and it disappeared when tweaks were made, but that seemed to fit with the industrial look provided by the rebar that was used to form a trellis. 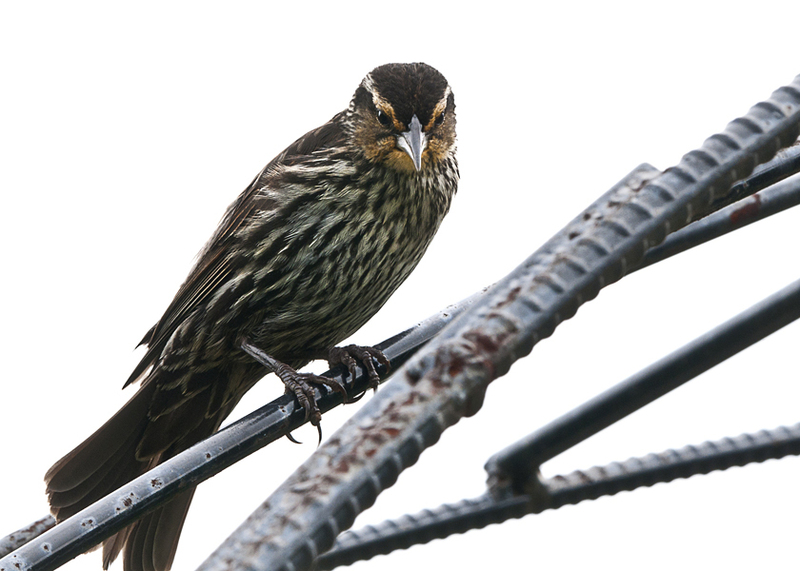 Here is another shot of the blackbird on the trellis, with some greenery in the background. You can see some of the details of the trellis, and it looks like the rusted metal is almost a perfect color match for some parts of the bird. My blog is still less than three months old, so I have a number of my pre-blog favorites that you have not yet seen. I will occasionally share some of them when I don’t have any new material or don’t have time to prepare the new photos.